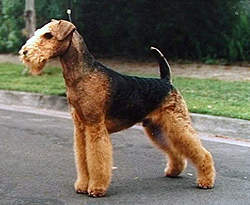 Airedale Terrier: The Airedale Terrier , also called Bingley Terrier and Waterside Terrier, is a dog breed of the terrier type that originated in the valley (dale) of the River Aire, in the West Riding of Yorkshire, England. It is traditionally called the "King of Terriers" because it is the largest of the terrier breeds. Airedale: Airedale is a geographic area in Yorkshire, England, corresponding to the river valley of the River Aire. The valley stretches from the river's origin in Aire Head Springs, Malham which is in the Yorkshire Dales, down past Skipton on to Keighley, Bingley and Shipley through to Leeds and Castleford and on to join the River Ouse at Airmyn. Airedale line: The Airedale line is one of the rail services in the West Yorkshire Metro area centred on West Yorkshire in northern England. The service is operated by Northern, on the route connecting Leeds and Bradford with Skipton. Airedale General Hospital: Airedale General Hospital is an NHS district General Hospital based in Steeton with Eastburn, West Yorkshire, England and is operated by the Airedale NHS Foundation Trust. Airedale was opened for patients in July 1970 and officially opened by the Prince of Wales on 11 December of the same year. Airedale Academy: Airedale Academy is a secondary school and sixth form on Crewe Road in a suburb of Castleford in West Yorkshire, England.